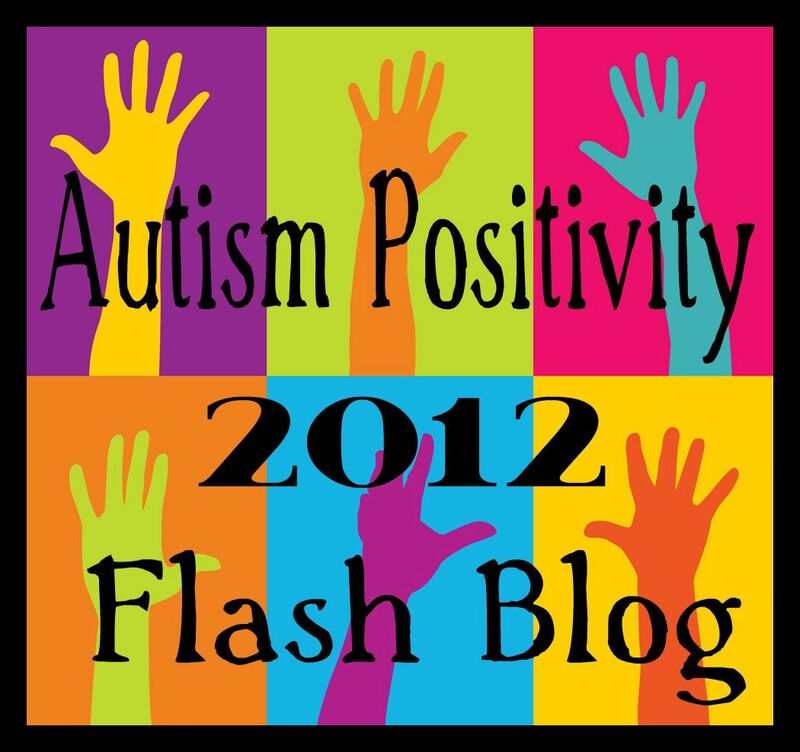 ← Flappiness Is… a Guest Post, Autism Awareness and the Ageless Wisdom of Margaret Mead! It is Sunday morning – and I asked H to help me with this post. I want to talk with him about Autism Awareness/Acceptance. It is April 1st… do you know what that means?? It means we get to goof off. OK honey – I want to talk to you about something else. Mom tell every one out there if they like pranking – they should go to Deal Extreme. I want to talk to you about somethings else: It is not just a day for pranks – it is also the start of Autism Awareness/Acceptance month. What is one thing you would tell people about having autism? I get cool ideas like how to make stuff and to design cool things out of Lego. Then: I can’t believe it is April. He is now off looking for his sack of jokes and tricks – I think he is trying to come up with some trick to freak his dad out. So this i s the reality… it is not about what I want… or what I want my kid to want… The message for this first day of autism acceptance month is about honouring the person and appreciating them for where they are at this very moment. My son is perfectly being a 13 year old that is thrilled to be pulling pranks on his father this morning. I helped him to make the finger in the box trick – which was a new one for him. He pulled out his nail through the finger illusion, and now he is messing with some invisible ink. He is interacting with me and with his dad and he is loving the response and emotional connection! Anticipation, interaction, joint attention, prediction, emotion sharing!! This is SOCIAL!! 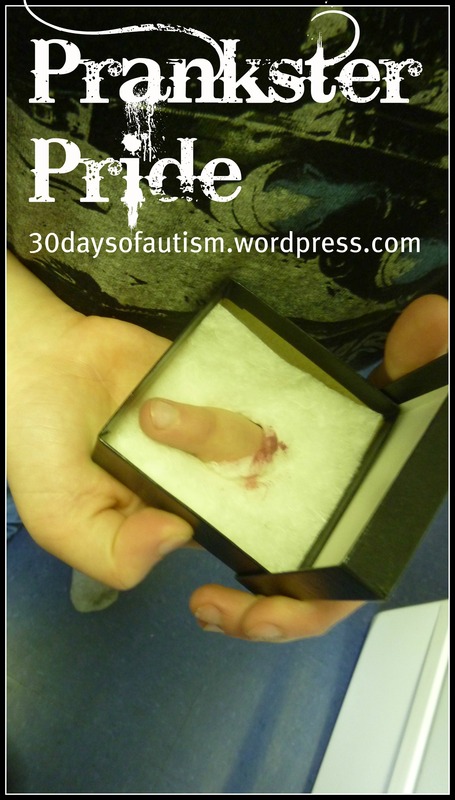 This entry was posted in acceptance, Aspergers, Autism, Father, promote social understanding and tagged acceptance, April 1st, April is Autism Awareness Month, asd, Aspergers, Autism, Prank, relationship, severed finger trick, social world. Bookmark the permalink. 3 Responses to Today is April 1st – do you know what that means??? Yes! Way to go! I must remeind myself that celebrating and loving my son sometimes means talking about elevators for twenty minutes or telling long winded stories about Mickey Mouse and his enormous swimming pool (with numbers!). What a wonderful way to start April! I think it’s far cooler to show how fabulous kids living with autism are than to talk about it… hey don’t look at me ^^^^^^^ he started it! I spend a lot of time talking about Super Mario… I sometimes have to remind him to say “Good morning, Mummy” first – if only to give me an extra two seconds to regain full-consciousness – but you’re right, it’s an excellent excuse for interacting (even if wearing at 6.30am), and it provides marvellous opportunities for me to praise his achievements too.